NOAA Expects Hurricane Season For 2018 To Be Near Or Above Normal : The Two-Way After a devastating 2017 hurricane season, the Atlantic isn't likely to get a break this year, NOAA says. The agency predicts 10 to 16 named storms this season, including up to four major hurricanes. 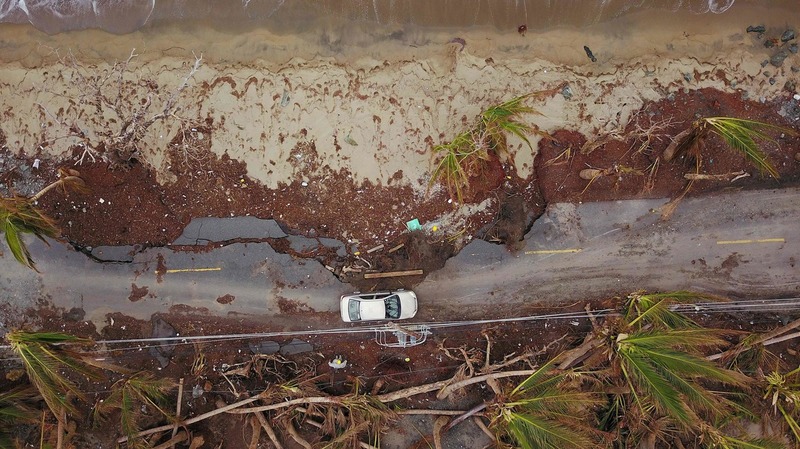 A car drives on a damaged road in the aftermath of Hurricane Maria in Humacao, Puerto Rico, on Oct. 2. Last year's hurricane season was one of the most active on record. NOAA is not expecting this season to be quite so bad, but an average season could do tremendous damage. That's especially true if a storm hits communities in Puerto Rico or along the Gulf Coast that are still struggling to recover from the devastation caused by Maria and Harvey last year. NOAA released the 2018 hurricane outlook on Thursday morning. NOAA and the Federal Emergency Management Agency recommend that members of the public make emergency and evacuation plans, and review their insurance coverage. NOAA slightly underestimated just how bad those hurricanes would be. It expected two to four major hurricanes; in fact, there were six major hurricanes, three of which made landfall as powerful storms.